If you think about it, taking a pill shouldn’t be that hard of a task. So why is it that every time my doctor prescribes me medication with the simple instruction of taking ‘one pill per day as needed for 10 days’ it always takes me upwards of two or three weeks to complete the task? Probably for many of us after a week or two we begin to feel better and taking our medications isn’t foremost on our mind and we fail to finish our medications. For others, taking necessary medications is a daily routine that can’t be stopped on a whim and must be taken or their health may be at risk. Today millions of Americans take one or even multiple medications on a daily basis and failing to take the right dosage can cause serious health issues. 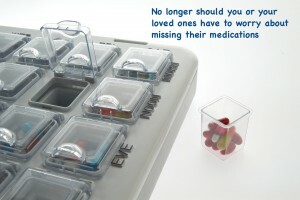 So I began to wonder, what if I there was a device that could remind me when I needed to take my medications? What if there was a piece of equipment to help me take my dosage in the morning and in the evening? Could my loved ones be notified if I failed to take my medications? With these questions in hand, I began my search for the perfect pillbox. My search helped me discover the MedMinder pill dispenser. The purpose of this device, quite simply, is to remind patients to take their medications on time. In addition, it helps keep caretakers in the loop as to when medications are being taken. When my test unit arrived I was taken aback by the size of the unit. Expecting to find a device the size of one of those plastic pill boxes you see at your local pharmacy, I was surprised to see that the pill dispenser was about the size of a standard textbook. Perhaps this is for intimidation purposes—there is no way I would be able to ignore something of this size reminding me to take my pills each day. But I guess given the fact the unit is designed to hold 28 different days’ worth of medications, the size is ideal. The unit uses a series of flashing lights, audible beeps, and other notification methods to remind me when to take my pills—suddenly I found myself dealing with both size and annoyance factors; there is no way I could win this battle. All kidding aside though, I could see how such alerts are handy for keeping caretakers in the loop when a patient isn’t complying with their schedule. Installing the device was a snap; simply plug it in and it’s ready to go. The next step was to register the device on the MedMinder website. As the product tester, I had the ability to play the role of both the patient and the caretaker, and setup the system to send me both types of notifications. After entering patient and caretaker information into the system I was prompted to setup descriptions for my medications: Name of medication, dosage, and quantity. I was also able to set up schedules for the day and time in which each dosage was to be taken. Since I wasn’t taking any medication at the moment I decided to use breath mints for my experiment. It is set up so there is a two-hour window in which each medication can be taken. For example, I set a schedule for a dosage to be taken every weekday at promptly 5 p.m. With this I was able to set up certain notifications to alert the caretaker if the patient had taken the medication in the designated time frame. At 4 p.m. on the first day, the compartment holding the specified dosage began blinking. You can also set the device to begin beeping if the compartment hasn’t been removed after a half hour, but seeing that I was testing Maya in an office setting, I decided to spare my coworkers of that little disturbance. When 5 p.m. rolled around and I still hadn’t removed the medication cup from the blinking compartment, my cell phone began ringing. Upon answering, I was greeted by an automated message informing me that I still hadn’t taken my 5 p.m. medication. I had also set the system to send me an email and a text message if the medication wasn’t taken by 5:30 pm. I was also able to set up email and text alerts for other instances, such as if the medication was taken outside of the pre-registered time, if someone had opened the unit to refill the compartments, if the system was turned off, or if the unit lost connection to the server (indicated on Maya by a red and green flashing light). I found the alerts to be very accurate, coming in about five or six minutes after the fact, informing me of the exact time each incident took place. After a week of testing the device, I received a weekly report highlighting how many times during the week a cup wasn’t taken out on time, how many times the device was refilled, if/when the wrong cups were taken out, etc. At any time during the week, I, as the caregiver, could go online and view a full report of occurrences and notifications. One nice feature on the patient’s end is the alert associated with a wrong cup being removed. Upon this action, a compartment would light up and the device would let out a loud monotone siren to alert me that the wrong cup has been taken out. Much to the dismay of the coworkers around my desk, this worked as advertised; I could definitely see this as being a very helpful feature for an older individual who may have poor eyesight. Overall, I found the Maya pill dispenser to be very helpful on the patient’s side. The combination of beeps, flashing lights, and phone calls I received served as useful and accurate reminders when a certain dosage was supposed to be taken. On the caretaker side of the equation, minus a few missed alerts here or there, the device provides the peace of mind you would want if you had the responsibility of making sure someone was adhering to their medication schedule accordingly. PreviousPrevious post:Pill Dispenser notifications in FrenchNextNext post:Live a healthier and worry-free lifestyle now!